Our new team member has taken its place at Salhouse Broad, part of the GoGoHare trail that you can see around Norwich City Centre and Greater Norwich, come and visit “Warden Willow”, the HGB Nature Trail or take some time to just sit and watch the world go by. 2018 Marks the charity’s 50th year and to celebrate, Warden Willow is one of 18 Hares that make up the Go Go Hares County Sculpture trail, this an additional trail has been added to highlight the many places of natural beauty and the many family attractions the county as a whole has to offer. Warden Willow has been created by artist Fiona Gowen (www.FionaGowen.co.uk), who has also designed our new Trail leaflets! Arriving by traditional Wherry Boat, Warden Willow started its journey to Salhouse Broad with a lovely trip down the river with friends from the Wherry Yacht Trust waiting on the banks, along with the Hoveton Great Broad Project Team, Kaitlin Fergusen, the Salhouse Broad Team, and the Lowland Rescue Team. Crowds stayed to enjoy the catering on offer during the day, the wonderful weather we had, and to take selfies with Warden Willow – marking one of the Hares off the trail list; you can follow @GoGoWardenWillo on Twitter. If you’re coming to visit Warden Willow on the GoGoHare Trail, why not combine your visit with the arts opportunities hosted by Kaitlin Fergusen, who will be offering art opportunities at Salhouse on Tuesday and Sunday throughout July, every Wednesday and Friday throughout August. If you would like to know more about our fantastic artist, Fiona Gowen, please visit http://fionagowen.co.uk/ or follow her on Twitter at @FionaGDraws. 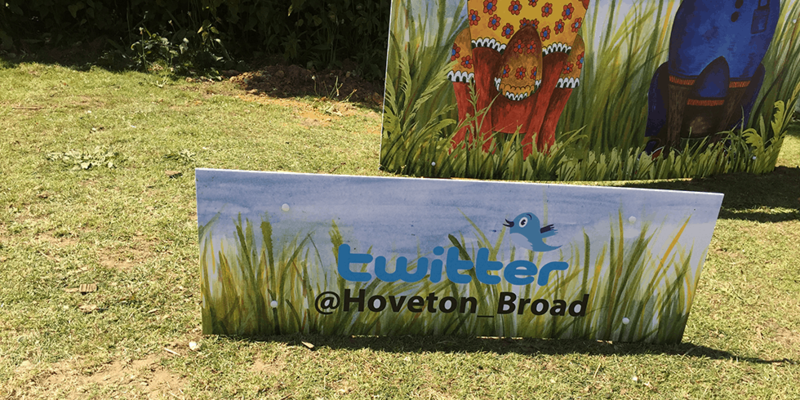 Follow #WardenWillow and find out about upcoming Hare events on Twitter (our username is @Hoveton_Broad). To find out more about BREAK charity and the GoGoHares 2018 Sculpture Trail go to https://www.gogohares.co.uk/.